Stanislavski in Carlo G oldoni’s La locandiera (The Innkeeper Woman, 1753), in 1898. Constantin Sergeyevich Stanislavski (Russian: Константин Сергеевич Станиславский) (January 17 [O.S. 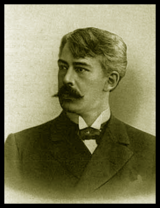 5 January] 1863 – August 7, 1938), was a Russian actor and theater director. His innovative contribution to modern European and American realistic acting has remained at the heart of mainstream Western performance training for much of the last century. Building on the directorially-unified aesthetic and ensemble playing of the Meiningen company and the naturalistic staging of Antoine and the independent theater movement, Stanislavski organized his realistic techniques into a coherent and usable ‘system.’ Thanks to its promotion and development by acting teachers who were former students and the many translations of his theoretical writings, Stanislavski's 'system' acquired an unprecedented ability to cross cultural boundaries and developed an international reach, dominating debates about acting in the West. That many of the precepts of his 'system' seem to be common sense and self-evident testifies to its hegemonic success. Actors frequently employ his basic concepts without knowing they do so. Stanislavski treated theater-making as a serious endeavor, requiring dedication, discipline and integrity, and the work of the actor as an artistic undertaking. Throughout his life, he subjected his own acting to a process of rigorous artistic self-analysis and reflection. His 'system' resulted from a persistent struggle to remove the blocks he encountered. His development of a theorized praxis—in which practice is used as a mode of inquiry and theory as a catalyst for creative development—identifies him as the first great theater practitioner. Stanislavski's work was as important to the development of Socialist realism in the USSR as it was to that of psychological realism in the United States. Many actors routinely identify his 'system' with the American Method, although the latter's exclusively psychological techniques contrast sharply with Stanislavski's multivariant, holistic and psychophysical approach, which explores character and action both from the 'inside out' and the 'outside in'. Stanislavski's work draws on a wide range of influences and ideas, including his study of the modernist and avant-garde developments of his time (naturalism, symbolism and Vsevolod Meyerhold's constructivism), Russian Formalism, Yoga, Pavlovian behaviorist psychology, James-Lange (via Ribot) psychophysiology and the aesthetics of Pushkin, Gogol, and Tolstoy. He described his approach as 'spiritual Realism'. Stanislavski came from one of the richest families in Russia, the Alekseievs. He was born Constantin Sergeievich Alexeiev; 'Stanislavski' was a stage name that he adopted in 1884 in order to keep his performance activities secret from his parents. The prospect of becoming a professional actor was "unthinkable" for someone of his social class; actors had an even lower social status in Russia than in the rest of Europe, having only recently been serfs and the property of the nobility. The Alexeievs were a prosperous, bourgeois family, whose factories manufactured gold and silver braiding for military decorations and uniforms. As a child, Stanislavski was exposed to the rich cultural life of his family; his interests included the circus, the ballet, and puppetry. Sergei Vladimirovich Alekseiev, Stanislavski's father, was elected head of the merchant class in Moscow in 1877. That same year, he converted a building on his estate at Liubimovka into a theatre for the entertainment of his family and friends. Stanislavski started, after his début performance there, what would become a life-long series of notebooks filled with critical observations on his acting, aphorisms, and problems. A second family theater was added to their mansion at Red Gates, on Sadovaia Street in Moscow, in 1881; their house became a focus for the artistic and cultural life of the city. That year, rather than attend university, Stanislavski began working in the family business. In 1885, Stanislavski studied at the Moscow Theater School, where students were encouraged to mimic the theatrical 'tricks' and conventions of their tutors. Disappointed by this approach, he left after three weeks and instead went to study at the Maly Theatre, where he learned to rehearse well, appear fresh during performances, and extract energy from the other stage players, rather than the audience. 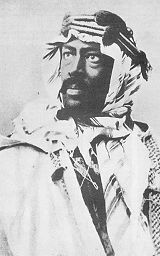 However Stanislavski's enlightenment came mostly from his encounter of Italian master actor Tommaso Salvini's portrayal in Othello. Stanislavski thought Salvini was a "tiger of passion," full of truthfulness, power, artistry, graceful movement and perfection. Stanislavski shaved his goatee and trimmed his moustache like Salvini and, at twenty-five, adopted the name Stanislavski, unsurprisingly similar to Salvini's name. Stanislavski adored the realism of the design and costumery as well as the discipline of the rehearsal which is yet another example of Stanislavski extracting what he likes about certain theories and practices, and discarding the rest. 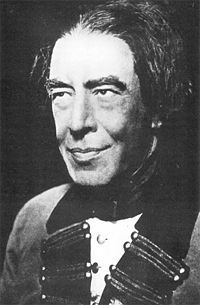 Stanislavski began attaining a reputation throughout Moscow as a modern and innovative director with such productions as Uriel Acosta, Othello (where Stanislavski travelled to Venice for costumes and artifacts) and The Polish Jew. In 1897, the Society had a slew of failed productions and unmotivated actors. It was then that critic, teacher and dramaturg Vladimir Nemirovich-Danchenko, conversed with Stanislavski for 18 hours about their problems with modern theater and their desire to create what would be known as the Moscow Art Theatre. In 1897 he co-founded the Moscow Art Theatre (MAT) with Vladimir Nemirovich-Danchenko, but the theater began operations in 1898. The first production MAT produced was the critically acclaimed and previously censored Czar Fyodor by Alexei Tolstoy. Anton Chekhov's The Seagull was also performed. Initially Chekhov did not grant Danchenko's request to stage the play because he wanted a more experienced troupe to perform it. Stanislavksy beautified and innovated Chekhov's script, and it created a stir with the audiences. In the view of one critic, "his detailed realism transformed the most commonplace scene into an orchestrated display of minute effects... something modern had been born." The MAT had created what became known as psychological realism. Psychological realism embodied hidden conflicts within relationships, which exposed that which is so embedded in everyday life. Chekhov never liked the rendition of his play, but the rest of the audience, and the rest of the world, responded very favorably to the work of the MAT. The MAT became known as the House of Chekhov as they produced Chekhov's melancholic plays (though the playwright himself always insisted they were comedies) like Uncle Vanya, Three Sisters and The Cherry Orchard. The Moscow Art Theatre became a venerable institution and opened up classes in dance, voice and fencing. During the Russo-Japanese War, the group traveled to Germany and Eastern Europe, where they were so admired that one German playwright called them "artistic divinities." Parades were made in their honor, as the Europeans never saw such brilliant theater. Upon returning to Russia, Stanislavski fell into an artistic crisis, where his acting and directing became erratic, as he professed his lack of fulfillment and inspiration. He went to Finland with his wife on vacation, and came back to give birth to his acting system that would change what it means to be an actor. Stanislavski's ‘system’ focused on the development of artistic truth onstage by teaching actors to "live the part" during performance. Despite being primarily known in The United States for Realism, Stanislavski developed the system to be applied to all forms of theater, directing and producing melodrama, vaudeville, opera, etc. In order to create an ensemble of actors all working together as an artistic unit, he began organizing a series of studios in which young actors were trained in his system. At the First Studio of MAT, actors were instructed to use their own memories in order to naturally express emotions. Stanislavski soon observed that some of the actors using or abusing Emotional Memory were given to hysteria. Although he never disavowed Emotional Memory as an essential tool in the actor's kit, he began searching for less draining ways of accessing emotion, eventually emphasizing the actor's use of imagination and belief in the given circumstances of the text rather than her/his private and often painful memories. Stanislavski's ‘system’ is a systematic approach to training actors. This system is at some point different from but not a rejection of what he states earlier in affective memory. At the beginning, Stanislavski proposed that actors study and experience subjective emotions and feelings and manifest them to audiences by physical and vocal means—Theater language. While his System focused on creating truthful emotions and then embodying these, he later worked on The Method of Physical Actions. This was developed at the Opera Dramatic Studio from the early ‘30s, and worked like Emotion Memory in reverse. The focus was on the physical actions inspiring truthful emotion, and involved improvisation and discussion. The focus remained on reaching the subconscious through the conscious. Stanislavski survived the Russian Revolution of 1905 and the Russian Revolution of 1917, with Lenin apparently intervening to protect him. In 1918, Stanislavski established the First Studio as a school for young actors and wrote several works: those available in English translation include An Actor Prepares, Building a Character, Creating a Role, and the autobiography My Life in Art. Stanislavski always thought of his system as if it were a table of contents for a large book which dealt with all aspects of acting. His final work, now known as The Method of Physical Actions (see Stanislavski's ‘system’), is in no way a rejection of his early interest in sense and affective memory. At no time did he ever reject the notion of emotion memory; he simply found other means of accessing emotion, among them the absolute belief in given circumstances; the exercise of the imagination; and the use of physical action. 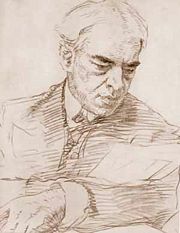 A portrait of Constantin Stanislavski by Valentin Serov. Stanislavski had different pupils during each of the phases of discovering and experimenting with a Universal System of acting. One such student, Ryszard Bolesławski, founded the American Laboratory Theatre in 1925. It had a tremendous impact on American acting, when one of Boleslawski's students, Lee Strasberg, went on to co-found The Group Theater (1931-1940) with Harold Clurman and Cheryl Crawford, the first American acting company to put Stanislavski's first discoveries into theatrical practice. Boleslawski had been in Stanislavski's class when experimenting with Affective Memory. Stanislavski's theory later evolved to rely on Physical Action inducing feelings and emotions. Among the actors who have employed Stanislavski's System in some form are Jack Garfein, Jack Nicholson, Marilyn Monroe, James Dean, Marlon Brando, Montgomery Clift, Harvey Keitel, Steve McQueen, Paul Newman, Warren Beatty, Robert Duvall, Johnny Depp, Sidney Poitier, Jessica Lange, William Hurt, Dustin Hoffman, Robert De Niro, Al Pacino, Gene Hackman, Kevin Spacey, Jane Fonda, Henry Fonda, Benicio del Toro, Mark Ruffalo, Vincent D'Onofrio, Kate Winslet, Adrien Brody, Denzel Washington, Elizabeth Taylor, Hillary Swank, Anthony Hopkins, and Sean Penn. Sir John Gielgud said, "This director found time to explain a thousand things that have always troubled actors and fascinated students." Gielgud is also quoted as saying, "Stanislavski's now famous book is a contribution to the Theatre and its students all over the world." Stanislavski's goal was to find a universally applicable approach that could be of service to all actors. Yet he said of his System, "Create your own method. Don't depend slavishly on mine. Make up something that will work for you! But keep breaking traditions, I beg you." Stanislavski's aim was to have all of his character's performed as real as possible. He was well known for the realism of his plays. Mikhail Bulgakov satirized Stanislavski through the character Ivan Vasilievich in his novel Black Snow (also called "The Theatrical Novel"). (It is no coincidence that Ivan Vasilievich was the name and patronymic of the notorious sixteenth-century czar Ivan the Terrible.) In Bulgakov's novel, Ivan Vasilievich is portrayed as a great actor, but his famous acting "method" is held up as a farce, in fact often hindering actors' performances through ridiculous exercises. Bulgakov's cutting portrait of Ivan Vasilievich likely reflects his frustrating experiences with Stanislavski during the latter's eventually aborted production of Bulgakov's play A Cabal of Hypocrites in 1930-1936. While this depiction of Stanislavski is in stark contrast to most other descriptions, including those of Westerners who had met him, it should be noted that Bulgakov and Stanislavski were otherwise good friends. ↑ Stanislavski began developing a "grammar" of acting in 1906; his initial choice to call it his System struck him as too dogmatic, so he preferred to write it as his ‘system’ (without the capital letter and in inverted commas), in order to indicate the provisional nature of the results of his investigations. Modern scholarship follows that practice. See Benedetti (1999, 169). ↑ Milling and Ley (2001, 2) and Carnicke (1998). ↑ Not only actors are subject to this confusion; Lee Strasberg's obituary in The New York Times credited Stanislavski with the invention of the Method: "Mr. Strasberg adapted it to the American theatre, imposing his refinements, but always crediting Stanislavsky as his source" (Quoted by Carnicke 1998, 9). Carnicke argues that this "robs Strasberg of the originality in his thinking, while simultaneously obscuring Stanislavsky's ideas" (1998, 9). ↑ The introduction to this article draws on the introductions and overviews in the following commentaries: Banham (1998), Benedetti (1989), Carnicke (1998), Counsell (1996), Innes (2000), Milling and Ley (2001). ↑ "If, in the United States one could be 'rich as Rockefeller', in Moscow the corresponding expression was, and is, 'rich as Alekseiev'" (Benedetti 1999, 3). "a friend at Luibimovka, and an admirer, as he had been as a boy, of the ballerina Stanislavskaia. It was a safe name to adopt. Of Polish origin, it suggested humble status and was unlikely to be associated with one of Moscow's most eminent bourgeois families." ↑ "The children were taken to the theatre and concerts almost as soon as they could walk" (Benedetti 1999, 10). ↑ Stanislavski played Matthias in The Polish Jew, which is a role made famous in the England by Henry Irving under the play title The Bells. See Benedetti (1999, 58). This page was last modified on 21 March 2017, at 18:52.